The Canadian Science-Class Rover Prototype, REX, simulates Mars Sample Return. Credit: CSA. Continuing with our Summer Reading Series of articles or interviews that still have some relevance today, we present Canada’s Fledging Rover Program Is Facing A Rocky Future which outlined the state of rover development in Canada in the fall of 2011. The story was written by Elizabeth Howell and originally published in Space Quarterly Magazine in December 2011. Six years later many of the same players are still working on rover technology and the Canadian Space Agency has amassed a small fleet of prototype rovers. The initial investments the government made back then might pay off in the not too distant future as Canada sets its sights on the moon as part of an international effort. Born from government stimulus funding generated during the last economic downturn, a number of rovers are being constructed at firms Neptec, MacDonald Dettwiler and Associates Ltd. (MDA) and MPB Communications. The companies and their partners, both commercial and academic, face a hard deadline of March 31, 2012 for everything to be completed before the stimulus funding ceases. Afterwards, the future is unclear. “I’m certain that (the Canadian Space Agency) has plans, and I’m certain they’re making budget submissions to Treasury Board like every (other department), but they’re not able to count on anything,” said Iain Christie, the President of Neptec, in an interview with Space Quarterly. The Canadian Space Agency (CSA) has a fairly static budget and has spent an average of $310 million per year for much of the past decade. The budget peaked this year with a planned spending of $424.6 million. However forecast budgets for the next two years will see spending fall to an estimated $317.5 million in 2013-2014. The peak this year includes the bulk of the $110 million stimulus funding the CSA was given in 2009 to spend by March of 2012. The stimulus funding was allocated to areas such as robotics and satellite technologies to examine Canada’s north. The rover program took the lion’s share of the funding through a flurry of contracts issued in 2009 and 2010, under the space agency’s Exploration Surface Mobility program. The money provided a temporary boost to companies looking to diversify after the shuttle program finished, but at the same time, also gave them a short leash; once the stimulus funding ended, so would much of the push behind developing the rovers. 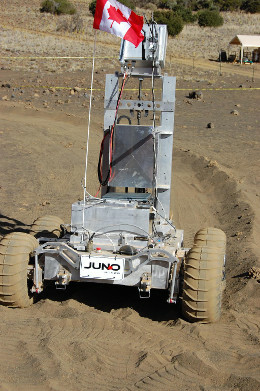 A prototype of Neptec’s Juno rover is tested at an analogue site in Hawaii. Credit: Neptec. For example, Neptec won an $11-million CSA contract in 2009 to develop a Lunar Exploration Light Rover, which it later dubbed ‘Juno’. 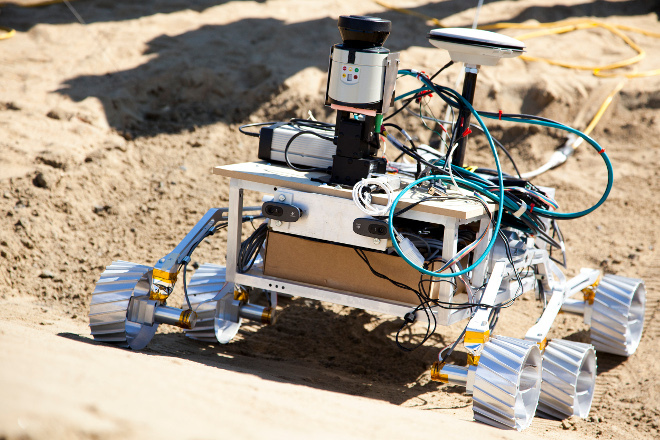 This past summer, a new prototype of the rover was put through its paces at an analogue site. The company also received a separate contract for a new rover called ‘Artemis’, which it must deliver by the March 31, 2012 deadline. Things are going well with the programs, said Mr. Christie, who declined discussing specifics of the rovers’ design or performance as the contract for the CSA is not yet complete. What worries him more these days, he said, is that Neptec has spent time, money and much effort developing an expertise in rover exploration – all finite resources for which the company seeks a return. Now, it is at risk of letting rover employees go or reassigning them after the funding ends, losing the expertise the technicians built up during the last two years. MDA is also hard at work finishing two rovers that it received the contracts for in 2010. Like Neptec, the company has a $11 million Lunar Exploration Light Rover under development that is intended to carry tools to excavate and extract resources on the lunar surface, and possibly carry human passengers. In addition, MDA is working on a $6 million Mars Exploration Science Rover with autonomous capabilities to drive over terrain, picking out the safest path possible among the rocks and craters on the surface. Both projects are just about finished the design phase and ready to move into the building stage, said Nadeem Ghafoor, MDA’s manager for space exploration, in an exclusive e-mail to Space Quarterly. “Next year (is) the big exciting year,” he added, as the rovers start to come together and the payloads will be integrated on to the structures. In some cases, he noted, practice integration could happen on other payload vehicles. In a word, Mr. Ghafoor conveyed a rosy message in the rover program – for now. MDA has pride in the advancement of Canadian space technology and is pleased with how the partnerships with academia and industry are progressing. Afterwards, though, the future gets murky. Researchers at Carleton University are also hoping their role in the rover story will continue after spending two years developing the chassis for Kapvik, a $1.9-million miniature rover intended to demonstrate technologies for Mars on Earth, such as an MDA-built winching system to bring the rover up steep hills. Kapvik micro-rover. Credit: Carleton University. The rover is due at the Canadian Space Agency in 2012, but after then, he noted, the students can possibly get it back temporarily as the CSA will need further studies done in analogue sites; these are artificially built areas that are intended to include elements of the lunar or Martian surfaces such as rocks and craters. The academics working in the rover programs were just as aware of the stimulus funding ending as their corporate partners, he noted. On a go-forward basis, he suggested the CSA could look to academia to take a lead role in projects such as rovers, rather than requiring industry to be the lead partner, as academia can integrate the development into larger programs that eventually breed new expertise. All of the teams worked hard, but there is no firm guarantee of what sort of return they will get. The companies started up rover programs when the CSA gave them money, but with no further funds coming, the future of those development teams is in doubt. Without an assurance that an investment in rover development is financially worthwhile, the companies will have no choice but to switch their employees to other projects, or to lay them off. This would rob Canada of the chance to lead in rover technology just when the program is getting off the ground.